It wouldn’t be a modern farmhouse bathroom mood board without classic subway tile and oil rubbed bronze. For our bathroom makeover, we’re sticking with a neutral black and white color palette and incorporating a wood vanity and marble hexagon tile floors. Last week I shared with you the horrid before pictures of our bathroom renovation, but today is finally about some pretty stuff! I can’t wait to share the bathroom mood board with you (which is my favorite part, of course). I’ve had plenty of time to find inspiration and dream up something amazing in my head. I know you’re going to love this this modern farmhouse bathroom mood board! We’re doing this big modern farmhouse bathroom renovation as part of One Room Challenge! If you’ve never heard of it before, it is a bi-annual event where literally hundreds of bloggers join together and makeover one room in their home and share updates about it over 6 weeks, all leading up to the big reveal in week 6. 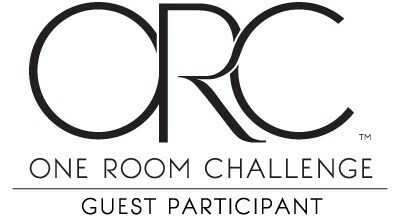 Be sure to check out all of the amazing One Room Challenge projects here! One Room Challenge Week 2: Modern Farmhouse Bathroom Design Plans – you are here! One Room Challenge Week 6: THE BIG REVEAL!!! << see how the bathroom turned out! This modern farmhouse bathroom mood board post contains affiliate links, but nothing that I wouldn’t wholeheartedly recommend anyway! Read my full disclosure here. Are you ready to see our modern farmhouse bathroom mood board?? Ahhhh… now that’s better right. Let’s just forget those horrible, scary pictures that literally could be from a horror film and let’s just think of these pretty, happy things. Classic white 3×6 subway tile – going in the shower and we’re also doing a full wall of it behind the vanity, woohoo! Rub a dub dub sign – Click here for full tutorial. We had this is our farmhouse master bathroom at the old house and will be reusing it in here. Round mirrors – these were a STEAL at only $20 each…say WHATTT!? Wood vanity – From Avanity | Buy it here | This was one of the first things that we decided for the bathroom and you can say it inspired the rest of the room’s design! Wall paint color – Also the same color we used in the nursery, I’m all for using safe gray paint colors that we know we love. 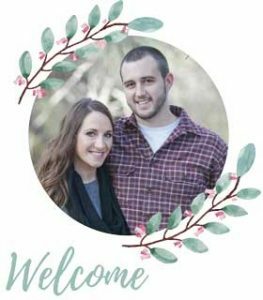 Ready for an update on our modern farmhouse bathroom renovation?! If you’re wondering how things are coming along with the big renovation now that we’re in week 2 of the One Room Challenge (eeeeeek, only 4 more weeks to go!). Things are coming along…slowly, but surely! We’ve got lots of supplies in the mail and on our way to us now….so it’s a little bit of keeping our fingers crossed and hoping the expected shipping dates all come through on time. We are specifically waiting on our tile shipment, which should be here next week on Tuesday and then we have to get the flooring installed & grouted on Tuesday & Wednesday nights after the kiddos go to bed because the countertop company is coming by on Thursday morning to measure everything to create the template to cut the quartz. Whew. That means the vanity needs to be in by then, which is currently in our garage. 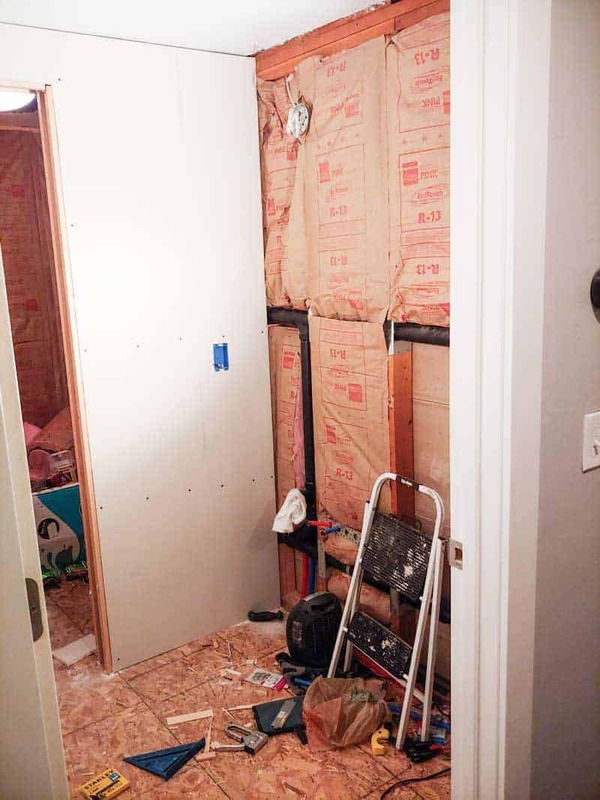 This is the first time that we have taken on a project of this size (our first ever bathroom renovation) and definitely the fist time where our timeline is so compressed….needless to say, we’re learning A LOT. Tension has been a bit high in our household the last couple of days, so it’s been ultra important to communicate to keep things sane in the marriage department. 🙂 If you’ve ever renovated with your spouse with two kiddos running around, while working full time and had a compressed timeline….you know what I mean, am I right? I mentioned on IG Stories that we decided to add insulation last week because the bathroom is right between our baby’s room and our master bedroom, so this will help create a sound barrier. We got the divider wall up for the water closet that will have a pocket door. The plumbing is more or less done and ready to go…. we discovered yesterday that the floor was entirely level under the tub so we have to do level that out last night and we had the tub jacked up while it was drying. Oy! My brain hurts. Hopefully this weekend we can start texture most of the drywall and start painting (because we’re not waiting on any supplies for those tasks). Fingers crossed my friends, fingers crossed. Build walls Learn how to build a wall here! Install pocket door on divider wall Learn how to frame a door in a wall here! 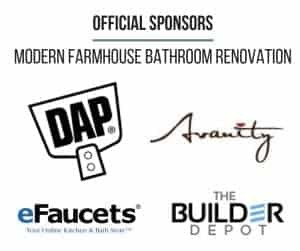 Huge thanks to our official sponsors of this renovation! Want more behind the scenes looks at our modern farmhouse renovation? If you want tons of behind the scenes update on our modern farmhouse bathroom One Room Challenge renovation, the best place for you is my Instagram Stories!! If you want to catch up from the beginning, head over to my Instagram profile and click on the “New Bathroom Build” highlights button. 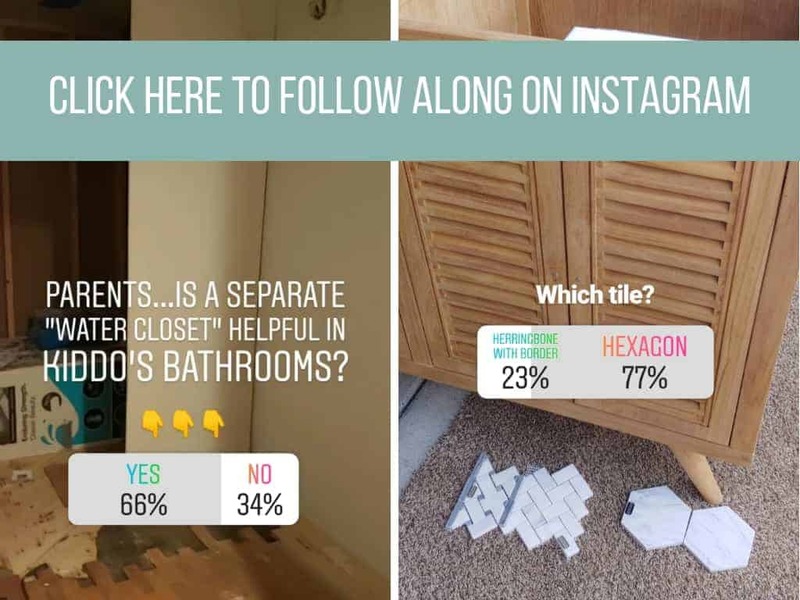 Be sure to follow our account to see you can see the day to day updates and help us out with decisions like these below…Our IG followers helped us already by giving us feedback on dividing walls for water closets and the floor tile options! I love that vanity!! Such great picks for your room! Love that vanity!! And yes, last week was pretty stressful for all of us too. Everyone is uncomfortable, the kid and dog want more attention. It’s going to be so worth it though! Love your plans! It’s going to be gorgeous!! Good luck! Love your mood board, Chelsea! I especially love that vanity! Can’t wait to see how everything comes together. Good luck! That wood vanity is AMAZING! And I’m not a plant lady either. LOL! I try, but it just never works out! Haha! Your plan looks so great. Love all your choices, especially the tile and the vanity. Can’t wait to see it all come together for you. I love all the details for this bathroom, especislly that cabinet.